18 Dec 2018 --- Parents cite restaurants as the most common source of food sickness in kids, but just one in four check inspection reports before dining out, a report from C.S Mott Children’s Hospital National Poll on Children’s Health at the University of Michigan has found. One in 10 parents say their child has gotten sick from spoiled or contaminated food, and foodborne illness affects more than 75 million people a year. 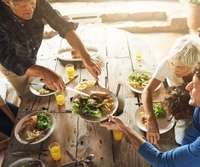 These are often caused by toxins, parasites, viruses and bacteria – such as salmonella and E. coli – and the researchers recommend that parents use simple precautions to avoid illness, such as checking restaurant inspection reports and following food safety rules when cooking and storing food. 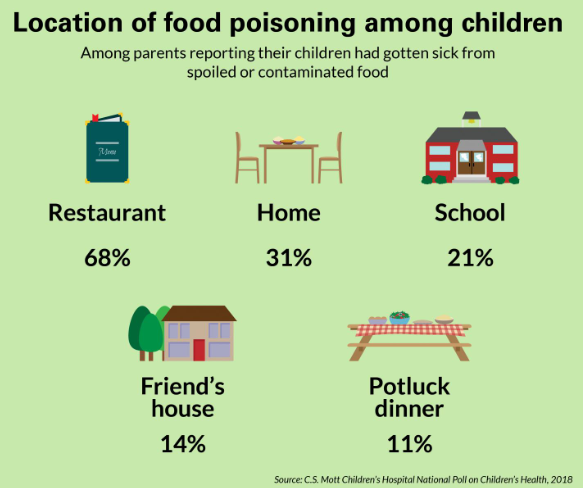 “In most cases, children recover quickly from food poisoning, but it can be debilitating,” says Gary L. Freed, Co-Director at Mott Poll. “It’s impossible to protect children from food-borne illness completely. However, there are strategies to try to reduce the risk of getting sick from eating spoiled or contaminated food. We found that while parents paid closer attention to food safety in their own home, they were not always as cautious about outside sources,” he adds. If a refrigerated product was more than two days past its expiration date, 57 percent of parents said they would smell or taste it themselves to see if it was OK to eat, while 43 percent said they would automatically throw the food away. If parents heard that a food product in their home had been recalled, almost all would not feed it to their children with 58 percent reporting they would throw it away and 40 percent returning it for a refund or replacement. Food poisoning can occur when germs, either certain bacteria or viruses, contaminate food or drinks. This can happen at many different places as food moves from harvesting, to packaging, to preparation and to serving. Once contaminated food enters the body, some germs release toxins that can cause diarrhea, vomiting and sometimes fever or muscle aches. Hand washing, keeping cutting boards clean and washed and storing and cooking food at proper temperatures are also important when preparing and serving meals. Freed says an increasingly common germ passed on by unwashed hands is the virus, Hepatitis A. A vaccine for this virus is recommended for all children at one year of age and can prevent almost all cases in those immunized. Symptoms of food poisoning start anywhere from an hour to three days after eating contaminated food. Freed says the most important initial treatment for food poisoning is making sure a child drinks plenty of fluids to prevent dehydration. Although food poisoning is a usually mild illness, there are multiple hospitalizations and even some deaths in the US each year. The labeling of food products is an important topic with regard to food safety. There has been debate in the industry surrounding the labeling of food, for example in relation to expiry dates, which have come under criticism for their role in contributing to food waste. The UK’s largest retailer, Tesco, is set to remove over one hundred more best before dates from its fruit and vegetable products, as customers say it helps them reduce food waste. Newly commissioned research reveals that 69 percent of customers believe scrapping best before dates is a good idea. 53 percent of shoppers in the same survey said they believe that by scrapping best before dates makes a difference, helping them keep fresh food for longer. Earlier this year, Arla launched an innovative solution to help combat both food waste and food safety by helping consumers understand when their dairy products have expired. The company, in collaboration with Mimica, launched a high-tech food label that turns “bumpy” when food has expired on its dairy products. Most recently, Thai researchers have uncovered a way to coat seafood in a biodegradable, edible film that can kill pathogens that survive the freezing process on the food surface. This kind of technology could help avoid food poisonings from seafood.